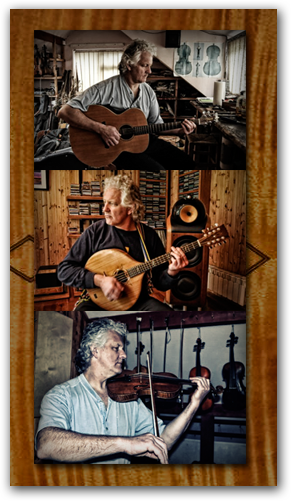 Located in the wooded Owenabue river valley near Carrigaline, Co. Cork, Master Craftsman James O’ Halloran has been crafting and restoring fine stringed musical instruments since 1979. James trained as a Guitar and Violin maker and during the 1990’s built and exported Violins, Guitars and Bouzoukis worldwide. However repairs and restorations are now the main focus. With over thirty years in the music industry James has vast experience dealing with all types of repairs to stringed instruments from vintage guitars of rare exotic tonewoods to futuristic composite and carbon fibre designs, Mandolins, Mandolas, Banjos, Violins, Violas, Cellos and double Basses are also catered for. During the 80’s and 90’s folk boom James played the folk circuits gaining valuable experience and insights into what musicians demanded of their instruments. He also has a keen interest in recording and production and enjoys appraising the end result of his work as recorded by musicians, engineers and producers in his studio.